The Unlucky Hunter: Yellowstone National Park is being invaded! Nothing is more iconic in the west than Yellowstone National Park. Few places in the world match its relatively untouched beauty. Families have visited this Eden for generations, gazing at its majesty and enjoying its wildlife. Unfortunately, wherever Man goes, change follows. 10% of the plant species in Yellowstone are non-native. We have learned by now that introducing non-native species into an ecosystem can be a disaster. 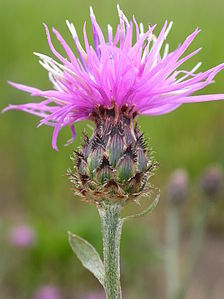 These non-native plants are most commonly found in areas frequented by people. It is unknown how most of these plants got there. Perhaps a seed was stuck in the tread of a boot or in the back of a truck. Most of these plants were not intentionally brought in, but now that they are in Yellowstone, they will never go away. We can do a good job of slowing the spread of invasive species, but eradicating them is virtually impossible. Non-native plants are not the only, or even largest, concern at Yellowstone. There are a number of non-native animals there as well. Some of these invasive species are threatening the existence of the native population. 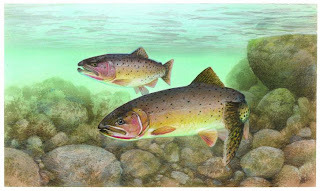 Of these non-native species the two that do the most damage are the Lake Trout and the Brown Trout. We all know about the problems Lake Trout have caused. 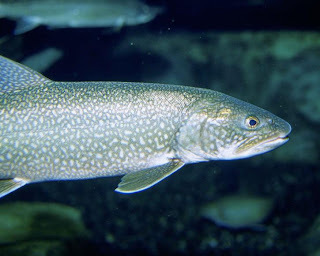 Lake Trout were introduced in the late 1800’s to areas of Yellowstone that were devoid of fish. Less than 20 years ago someone moved a few to areas that contain native Cutthroat Trout. They are decimating the local Cutthroat Trout population. Not only are Lake Trout hardier and longer lived than the Cutthroat, they prey on the Cutthroat. An adult Lake Trout can eat 50 Cutthroat a year. A Cutthroat - Just out of frame: a Lake Trout about to eat it. Cutthroat Trout are not the only animal threatened by Lake Trout. Many animals, such as Grizzly, Bald Eagles, and many other birds rely on the Cutthroat for food. Without this food, they are more vulnerable. To remedy this, Lake Trout are actively being netted and killed at an astounding rate. Tens of thousands of Lake Trout are destroyed every year. Lake Trout are in Yellowstone to stay. We can, and need to, work at reducing their numbers. But like feral hogs in Texas and the European Starling everywhere, this invasive species is not going anywhere. Brown Trout, on the other hand, do not have nearly the bad reputation as Lake Trout. This is surprising given that the Brown Trout are responsible for the local extinction of Cutthroat Trout and Arctic Grayling in the Madison and Gallatin river drainages. 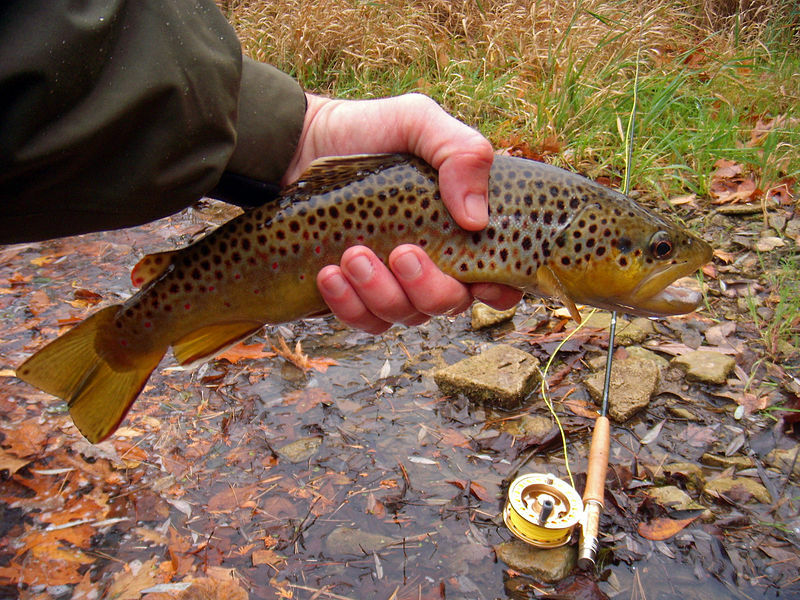 Most people are surprised to learn that Brown Trout are not native to North America at all. They were brought here from Germany and have hurt local fisheries all over the United States. Why are Brown Trout seen favorably while Lake Trout are considered demons? I believe it is partly due to the fact the Lake Trout do more damage, but it is also due to fishermen who enjoy catching Brown Trout. I could be wrong, but if Brown Trout were ugly, did not taste good, and could not be caught on a fly; they probably would be viewed a villains. Instead, they are a premier game fish. Don't take what I am saying wrong! There are many places where Brown Trout benefit the ecosystem. I love fishing for Browns on the Smith River in Virginia. We just have to be responsible and honest with ourselves about their effect. If there is one thing we can learn from the invasive species in Yellowstone it is that Man cannot regulate nature. There is little we can do to make it better. We accidentally kill the native species and cannot kill the non-native. The best we can do is try to maintain natures balance. Before you go to any new ecosystem, please clean your equipment. It only takes one stray seed to introduce a new species of flora. Never move a fish from one lake to another. Never release a pet exotic species into the wild. Whenever you encounter a known invasive species, do the right thing and destroy it humanely. If we all did these things, we would not have problems with invasive species.